Synopsis: The film Mithun is all set to hit the theatres this Friday on 13th July 2018 and it is directed by Prakash Janardhan Pawar whereas the starcast for the film include Vishal Nikam, Amruta Dhongade, Jaywant Wadkar, Mahesh Ghag and Rohit Awale and it is produced by Vilas Meher, Jivan Jadhav, Jitesh More, Chetan Gade and Prakash Janardhan Pawar under the banner of MV Entertainment and Gulab Production. 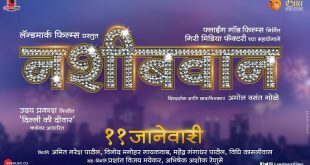 The lead roles for the film include Vishal Nikam and Amruta Dhongade along with Jaywant Wadkar as Bappu, Mahesh Ghag as Jaggu, Rohit Awale as Yuvraj, Shravani Solaskar as Deepa, Sanjay Khapre as Bhau and Anil Nagarkar as Wagh. The story of the film is jotted down by Prakash Janardhan Pawar where as the screenplay was carried out by Nilesh Mahigaokar, Aamira Isak Shaikh and Prakash Janardhan Pawar in the lead roles. The Dialogues has been jotted down by Nilesh Mahigaokar while the lyrics have been jotted down by Chinmay Lele, Akshay Walke, Swapnil Walke and Ganesh Helkar whereas the music – Ajay Jadhav and Digvijay Joshi and the Sound was carried out by Dawn Studio and the Cinematography was carried out by Sopaan Purandare and the Background Score carried out by Ajay Jadhav and Akshay Gurav and Cinematography (DOP) was carried Sopaan Purandare. The Art Director of the film is Suresh Hanumantrao Borde whereas the Costume is done by Nigar Isak Shaikh and the Make-up is carried out by Rajashri Gokhale while Sujit Kalidas Mukate is carried out the production part. The Publicity Design is carried out by Milind Matkar and the outdoor publicity was carried out by Ramesh Shetty. The film is a romantic movie, which has an interesting story line wherein the couple is not so serious about love but later falls in love.